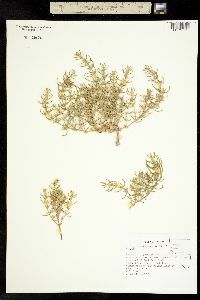 Nitrophila occidentalis (Moq.) S. Wats. Stems sometimes prostrate and stolon- or rhizomelike with scaly leaves, 7-20(-30) cm; above-ground stem not densely leafy. Leaves of main stems clasping at base, leaves of main stem sometimes connate, arched-spreading; blade linear, terete or subterete, at least in distal 1/2, 5-20(-30) × 0.7-1.5 mm, apex sharply acute or apiculate, sometimes retuse. Inflorescences solitary, sessile flowers, or if 2-3-flowered, additional flowers short-pedicelled. 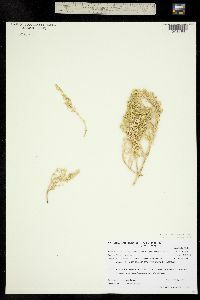 Flowers: perianth segments erect, pinkish to yellowish brown, 1-veined, ovate, 2-3.3 mm; stamens included; filaments shortly connate basally; style longer than stigmatic branches. Utricles concealed by persistent calyx. Seeds brown, ca 1.2 mm. 2n = 18. Flowering spring-summer. Relatively moist, alkaline flats or meadows, 400-1900 m; Calif., Nev., Oreg., Utah. Nitrophila occidentalis often occurs with Distichlis, Juncus, and Sarcobatus. 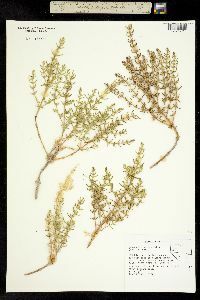 Duration: Perennial Nativity: Native Lifeform: Forb/Herb General: Herbaceous and somewhat bushy perennials, to 30 cm tall, stems numerous, tufted, sometimes prostrate and stolon or rhizomelike with scaly leaves, herbage glabrous. 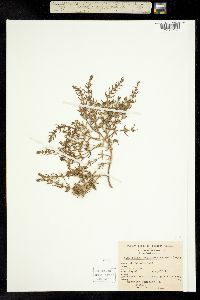 Leaves: Opposite, fleshy and usually clasping at the base, especially on the main stem, blades linear or leaves of main stem sometimes connate and arched-spreading, terete or subterete, at least distally, 5-30 mm long and 1-1.5 mm wide, apices sharply acute or apiculate, sometimes rounded or obtuse with a shallow central notch, margins entire, leaves not densely crowded on the stems. Flowers: Small, perfect, pinkish to yellowish brown, perianth segments 5, ovate, erect, 2-3.5 mm long, 1-veined, stamens 5, included, filaments shortly connate basally, style longer than the stigmatic branches and ovary, persistent, flowers solitary, sessile, or if 2-3-flowered, additional flowers short-pedicelled, borne in leaf axils. Fruits: Utricles concealed by the persistent calyx. Seeds brown. 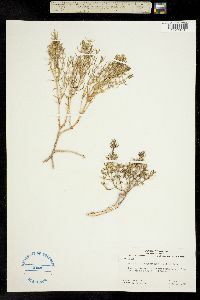 Ecology: Found on relatively moist, alkaline flats or meadows, from 1,000-6,500 ft (0-1981 m); flowering spring-summer. 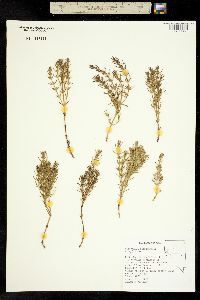 Distribution: Arizona, California, Nevada, Oregon, Utah Ethnobotany: Unknown. Synonyms: Banalia occidentalis Editor: LCrumbacher2012 Etymology: Nitrophila comes from the Greek nitron, "carbonate of soda," and philos, "fond of," i.e. "alkali- or soda-loving", while occidentalis means from the west, western.